The story of Camp Workcoeman begins with Scouting itself. Before William Boyce incorporated the Boy Scouts of America in February of 1910, various character building groups for young men already existed in the United States. Ernest Seton and Daniel Beard ran the two largest associations, the Woodcraft Indians and the Sons of Daniel Boon, respectively. When Boyce brought Robert Baden-Powell’s British Scouting model to the United States, he only owned the Boy Scouts of America name and had permission to use Baden Powell’s Handbook, Scouting for Boys. Edgar Robinson of the Young Men’s Christian Association ended up providing the organizational skills and the national network to get the BSA off the ground. Robinson pulled Seton, Beard, and two other Scouting associations together to form a nationwide movement. While Robinson was providing the first organization, the very first troops were already meeting. These groups formed along the same chaotic lines as the National Council. 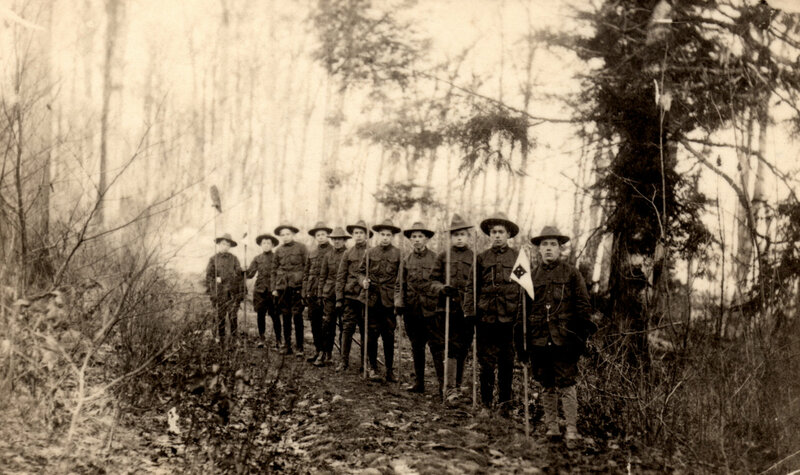 Often boys from a civic club or church started a patrol; some used Scouting for Boys before 1910. Sometimes these troops did not receive official charters from the national office in New York City, and many others gathered together and split apart without the Boy Scouts of America being the wiser. The first formally chartered troop in Litchfield County, possibly in Connecticut, was made up of the boys of the First Baptist Church, in Winsted. The Reverend Franklin Elmer provided the momentum for the troop and served as Scoutmaster. The photo below shows Winsted Scouts on a hike around 1910. Of the eleven Scouts in the photo, twelve if the photographer is included, some may be, Stanly Colt, Lester McFarland, Harold Sanford, Willys Sanford, Harold Smith, or Ralph Smith.